The Toronto polished chrome frame 14 light clear crystal spiral chandelier is a contemporary and visually stunning statement piece light fitting. Featuring a circular polished chrome multi-level frame, dressed with an outer spiral of crystal coffin drops strung together with square crystal buttons. Further crystal spirals drop down through the centre, terminating at a point in the middle. The 14 light bulbs are contained out of sight inside the outer crystal curtain and refract through each crystal to create a glimmering effect. 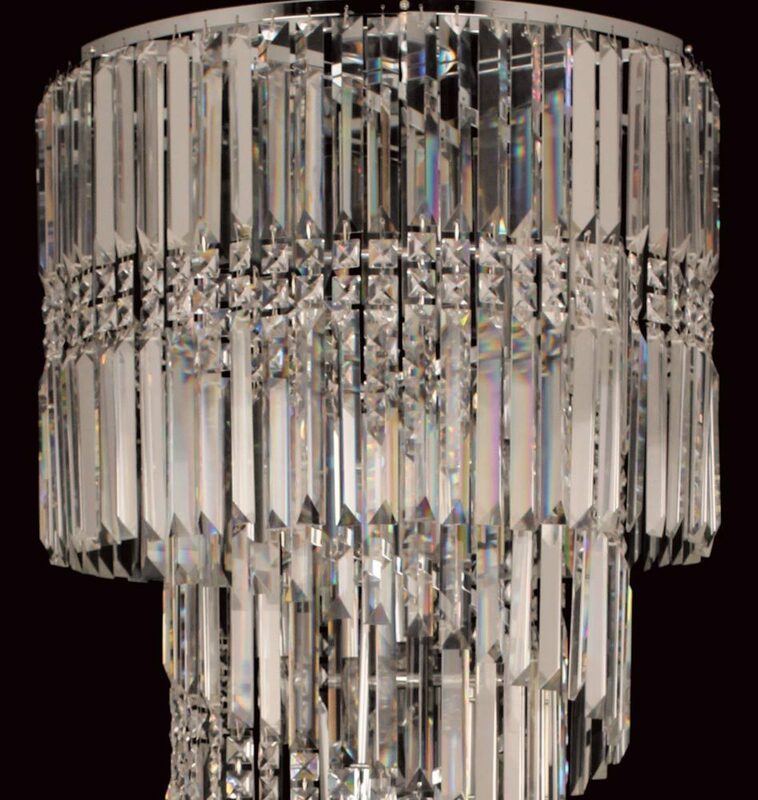 This is an artistic creation using quality crystal to create a feature light fitting. A statement piece that is sure to get everyone’s attention and add that wow factor to many interiors. This fitting is fixed directly to the ceiling and has a fixed height of 142cm. It is best suited to rooms with a high ceiling, stairwell, hallway or double height spaces. Please note that this fitting weighs in at 18.0Kg and requires careful installation. Supplied as shown in the image, no assembly required.